Sean and I experienced an extremely painful loss this winter. I'll spare you the details in this post but if you have no reference to what I am talking about, you can catch up from my last post, Tragedy Turned Triumph, here. As the title of that post implies, we were able to move past our tragedy but were in desperate need of a refreshing get-a-way. We needed a transformative travel--an experience that enabled self-reflection, reconnection, and a shift in our perspectives. We also wanted to pick a destination that allowed us to develop a deeper communion with nature + food + culture. Sean and I are BIG time foodies, drinkies (yes, I ridiculously just made up this word), and adventure seekers so it seemed the most obvious choice would be Spain, or Espana. We also recently learned Sean's ancestors dated back to the 1500s in Sevilla, Spain. Yep, we were definitely going to Spain. After a lot of brainstorming, researching, wine, and headaches, we decided to start with Barcelona, then make our way to Valencia, Sevilla, and finally, Madrid. I know I have fellow wanderlusters out there so I wanted to share the details of our travels in a three-part series for the next couple of weeks. Today, I'll start with our days in Barcelona. Day 1: After 24-long hours, we made it from Los Angeles, to New York, to Lisbon, and finally our final destination, Barcelona, Spain. Despite the exhaustion + jet lag, we dropped off our bags at our AirBnB room located in El Raval. El Raval, until recently, used to be referred to as the red light district and considered dangerous to wander around in. 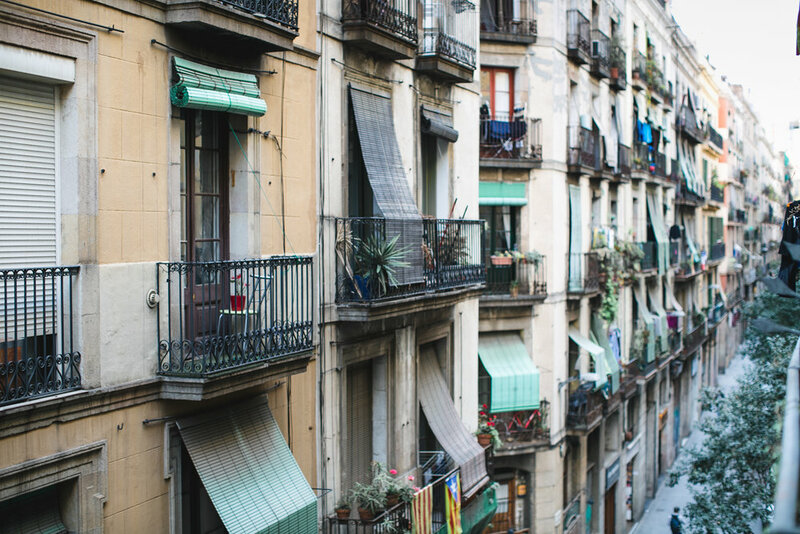 Today, Raval is a vibrant area, full of life, art, culture, and some of the most eclectic restaurants. The streets had no resemblance to Paris, whatsoever, but there was something so romantic about Raval's grungy look. For us, Raval was all the romance without the cheese--it was perfect. After dropping off our bags, we headed to our very first tapas restaurant that Sean found on Yelp. It was SO delicious and we had our first Cava experience! To be honest, at first, Sean and I shrugged our shoulders at the first sip of Cava. It tasted like dry champagne, what was the big deal? Ten minutes later until the rest of our trip, we couldn't stop talking about how amazing the Cava was. We are now Cava obsessed! I wish I had brought my camera but that was the last thing I wanted to do after a long trip. Just know, our first tapas and Cava experience was a great indication of how the rest of our Spain travels was going to go. The streets of Raval were doused with graffiti. Laundry hung from every balcony. And typically, these alleys would be full of skateboarders and young hip artists. One of the reasons why we loved this area was because of the lack of tourists. Space was small here but it really was so perfect and all the space we needed. The bed was comfy, clean, + soft. You could tell Juan (our host) is an artist + a romantic. Every little detail in his house was so intentional. (Photo also taken by Juan). The best part of this room was the view. Yes, all you could see were your neighbors and the streets, but I would sit out on this balcony every morning to soak it all in. The streets were alive at all times of the day, skateboarders in transit, people hanging and collecting their laundry, the smell of freshly baked croissants. UGH, loved it so much. The bottom left view from the balcony. Day 2: We woke up bright and early, grabbed a baguette + espresso to fuel our morning. Not far from our AirBnB, we walked to the Gothic Quarters, the oldest centers of Barcelona with buildings that date back to the medieval times. The best thing we did was get lost in the complexly laid out alleyways--they were dark but equally as enchanting and gave us the experience of time travel. The pathways led to open squares filled with cafes, bars, and small shops. The Gothic Quarters was also Picasso's old stomping grounds so of course we made it to the Picasso Museum. To be honest, Sean was a little more excited than I was about this but once I got lost in Picasso's work, I didn't want to leave. We then walked our way to La Boqueria, one of the oldest and still-running markets in Europe! I'm not sure I can put in to words our thoughts + experience here. To put it lightly...sensory OVERLOAD! Sean and I were definitely in our happy place--food everywhere. We enjoyed a small tapas meal at La Pinoxte and it was fantastico! Thank you, Anthony Bourdain for the tip. Later this night, we took a Food + Wine Lover's tour which was pretty great. We were a little disappointed in that we didn't really get to try anything too crazy or unique. It was everything we had tried already on our first day in Spain. BUT we did make some new friends! It was definitely worth the social experience. Small baguette + coffee shop around the corner of our street. This Gothic Cathedral took two centuries to build--from the 13th to the 15th century! Of course, this was a huge tourist attraction so surrounding the area was full of entertainers as well as beggars. A glimpse inside the cathedral. How can something so frightening-looking be so beautiful at the same time? No idea who this couple was but you could tell they were just as mesmerized by all the details and ambiance. This was the only shot I took inside the Picasso museum before I got scolded by my Catalonian guard. Whoops! Picasso came to Barcelona to attend a fine arts school and this was one of his many paintings. Can you believe he was only in his teens when he painted this master piece?? One of our highlights from the trip--the La Boqueria food market! So, this post is getting a little longer than I had anticipated. I'll continue our Barcelona trip sometime later this week!